Over on his blog Elias has uploaded a post that shows how he modified his RTL-SDR dongle to provide remote DC power through a bias tee. A bias tee allows you to inject DC voltage into the coax cable to power active antennas, or devices that need to be near the antenna such as LNA’s. The bias tee prevents DC power from entering the RTL-SDR front end (which would fry it) via a blocking capacitor, and also prevents RF energy leaking into the power supply by using a blocking inductor. In his post he writes how he made a simple hardware hack to the RTL-SDR PCB to enable 3.3V from the USB power supply to be used to power his active GPS antenna. To do this he removes the static protection diode and connects a nearby 3.3V pad to the antenna output through an inductor. The RTL-SDR already has a DC blocking capacitor in place. 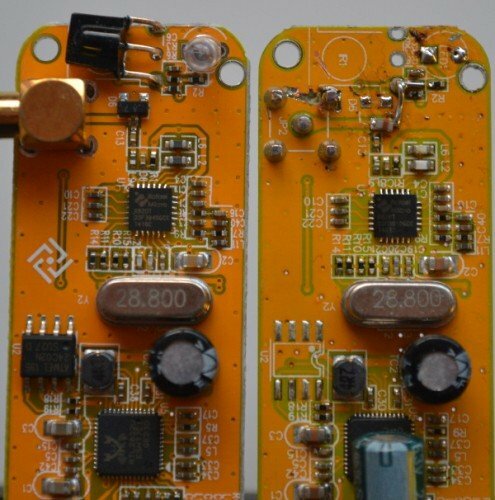 He writes that this mod unfortunately requires the static protection diode to be removed, so the RTL-SDR is no longer protected from static discharge. Previously in June of last year we posted about a similar bias tee hack by Fabio, where he used the 5V rail to power an inline LNA.